The EcoHitch® for the 2019 Subaru Ascent is full of strength and appeal that complements your Ascent. With this Subaru hitch, you’ll be able to bring your bikes, extra cargo and so much more. 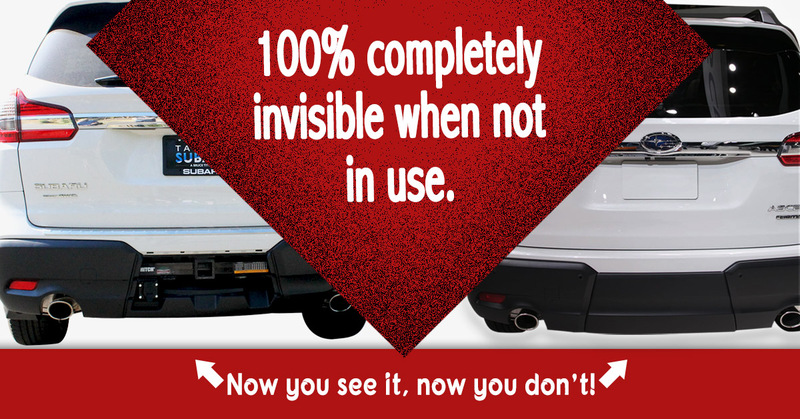 Designed to be completely concealed, only the receiver is visible once it's installed rather than having to see an unsightly crosstube underneath your vehicle. Rated for 750 pounds tongue weight and 5,000 pounds towing weight. If you love your Subaru Ascent, why not get a trailer hitch that allows you to maximize the capabilities of your Subaru? The Subaru Ascent EcoHitch is manufactured to match the Subaru Ascent’s innovative design and ensures your car remains the same without compromising its style or efficiency. Our invisi hitch is installed behind the removable panel – making it so the hitch is always hidden unless it’s being used. Instead of having a receiver hang below the bottom of your car, this Subaru Ascent hitch gives you the most clearance possible by being located behind the panel. The EcoHitch® for the Subaru Ascent is available in a 2-inch receiver size allowing you to choose which receiver best fits your needs. With the 2019 Subaru Ascent tow hitch you can hook up a variety of styles of bike racks, cargo trays and more! 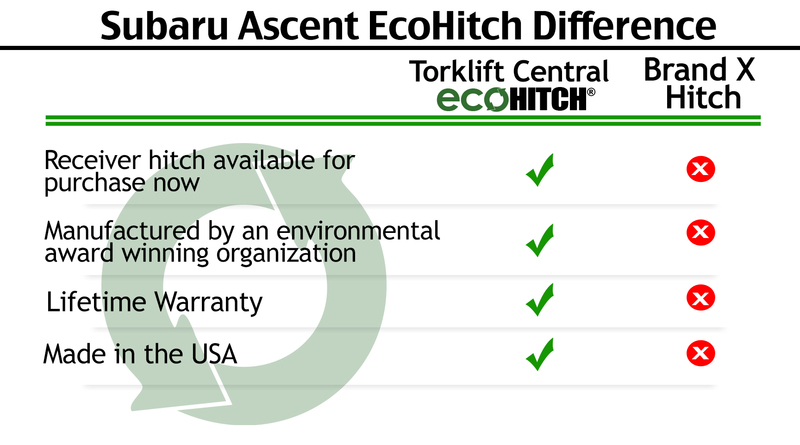 With the EcoHitch, you can avoid the inconvenience of roof racks that interfere with aerodynamics and cause strain when loading accessories like bikes. By using our invisi hitch, eliminate vertical clearance issues and potential damage to your Subaru while loading and unloading. Don’t lift overhead. Take it easy and save the excitement for your next adventure with EcoHitch for Subaru. Comes standard with a 7-way plug bracket to keep your trailer wires secured and safe from dragging and damage.